The blood orange is perhaps one of the most captivating fruits out there. Like the dragon fruit, passion fruit and kiwi, they are as interesting to look at as they are to eat! 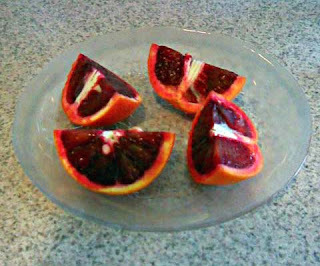 The blood orange gets it's ruby red flesh from a pigment called anthocyanin. Anthocyanin is also a powerful antioxidant, which is not usually found in citrus, but rather other red fruits and flowers. Just like other citrus, the blood orange is high in Vit C and potassium, so you can feel even better about enjoying one of these gems! I picked up a few at the farmers market today and had a couple as soon as I got home. 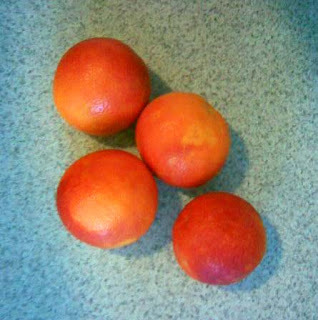 Blood oranges have a lighter orange flavor with a sweet hint of raspberry. They are delicious and can be used in many savory and sweet dishes. As for me, I like to enjoy mine straight up! I learned from the vendor that they originated in Italy and have been growing in Texas and California now for many years. There are three main types, but the one often found here is the Moro. I am fortunate to live in California where these beauties will be available up until May.